As we age, certain physical abilities can begin to deteriorate; this decline may be enhanced by genetics, lifestyle, or prior injury. One relatively common functional impairment is low vision, which may take the form of light sensitivity, reduced field of vision, reduced perception of sharpness or contrast, image distortion, or night blindness. Although low vision cannot be cured, it can be compensated for with sufficient, proper lighting. In your home, there may be opportunities to improve your lighting set-up that could translate to major visibility gains, allowing everyone in the household to move safely about and complete daily tasks with ease and efficiency. Read on to explore some key factors of better visibility and discover how an in-home occupational therapist can help you update your home lighting for safety. Most of us grossly underestimate the optimal amount of light needed to perform household tasks. In rooms lit by a single overhead source, you can supplement the ceiling fixture with task-specific lighting, such as table lamps or accent lights, to better light areas where you perform essential daily activities. Increasing the lighting level in the home has been proven to increase both reading rate and acuity in individuals with low vision, so a chair commonly used while reading should have a strong light source aimed at the page. In the kitchen or bath, attaching low-voltage lights to the underside of cabinets can shed new light on countertop organization and meal preparation. Importantly, for individuals with low vision, shadows or blind spots in a room increase the risk of injury. If your room lighting is too strong in one area over another, or doesn’t take nearby furniture or walls into account, it may create shadows. Therefore, it’s important to evaluate each room’s lighting for even coverage and adequate spacing, and add or adjust lights to achieve uniform illumination. An in-home occupational therapist can also help you identify problem areas and easily correct them. Glare is taxing on your eyes, and can also exacerbate eye strain and lead to further impairment over time. To minimize daytime glare, you can add or update window treatments to block direct sunlight at peak exposure. 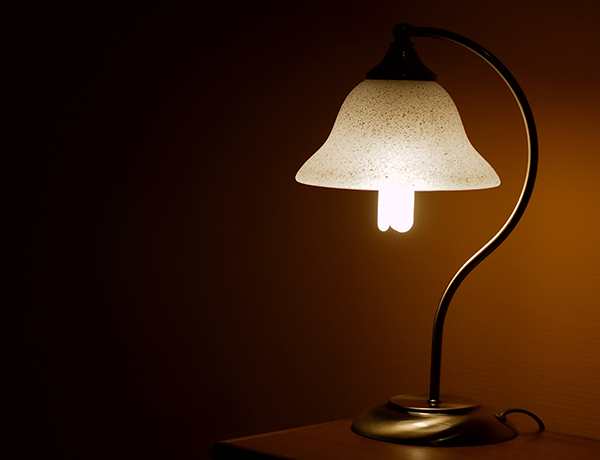 For indoor light sources, take care to avoid fixtures that directly expose the eye to light bulbs. Using proper lamp shades and adjusting the placement and/or aim of existing fixtures can help repair many glare hazards. Navigating a home in the middle of the night can be dangerous for a person with low vision, as it increases the probability that tripping hazards or other dangers will not be seen. The following improvements can lessen the risks associated with moving around the house at night. Nightlights. Use plug-in lights to illuminate pathways commonly used at night, like the one between the bed and the bathroom. Glow switches. Install glow-in-the-dark light switches to take the guess work out of locating and operating a switch in the dark. Flashlights. Place flashlights in easy-to-remember locations throughout the home, including near the bed. Motion-activated lights. Consider fixtures that detect your movement and automatically turn on the light; they are excellent options when a switch is difficult to access, or requires you to cross a dark room to reach it. Utilizing the assistance of an occupational therapist can drastically simplify the process of improving your home lighting. Occupational therapists review lighting as part of their standard home environment assessments, and as trained professionals, they have the skills and experience needed to identify problem lighting and make helpful suggestions and adjustments. Because every home is unique, and so is every individual, this kind of hands-on help can be the ideal way to attain a safe environment that is properly lit to meet your specific needs.